On Saturday, I went hiking with Amanda and Eileen in Oswald West State Park. 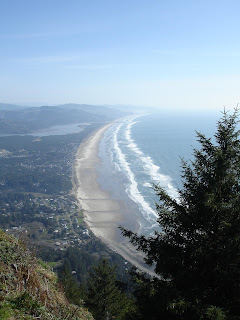 This is the view looking south along the Oregon coast from the top of Mt Neahkahnie. Visible to the left is the Nehalem Bay State Airport (FAA: 3S7, no IATA designation). We saw quite a few seals a bit further south down Nehalem Spit, on the bay side.